I went to a psychologist. I'm fine! Nothing to worry about really! I just got things out that i have been kinda afraid to share with people but i was also told some things by the psychologist that was really helpful to know. I'm a introvert. I knew that before i talked to her. But i have always seen as a burden. I never said anything in calss and got some bad grades out of it. I am a listner rather than a speaker. I can be soical, but I LOVE being alone. Well.. too much. And that is my problem. Okay. I got an appointment because i had quite a melt down at a school event were there was a party and some sleepover going on and i could not handle it. My new classmates are great and already the first week I said to a few of them that i could be a bit anxiously when there was too many people around and there was so much new stuff going on around me. This event was a whole academy sleepover thingy so there was a lot of people everywhere. Drunk people. It's all because of a really bad middle school experience that i don't drink. Not that anything bad happened to me, but i didn't want to do it and becuase of it, i didn't really have any friends and when i spoke to the teachers about it they basically told me to drink so i could get friends... Yeah.. No thanks. So i think it clicked for me when i bought my soda and someone was pointing out that i wasn't drinking. I have been made fool of so many times because of it.. so I went outside quick before i started crying infront of everyone. Those two people i told i was anxious saw it and i got a nice talk with one of my teachers and she signed me up for a talk with the psychologist. We spoke about how i was treated in 8-9. grade and how that has affected. It basiclly all started there because of the bullying. She said i most likly has social phobia because of it. But it was totally normal! She said "It is a normal reaction to something abnormal." because people should not be bullied. It's not normal! She told me how awesome it was that i actually got through the guideschool and that i knew that i had a problem. I should just stop being too harsh on myself, because it's normal and not my fault. And the thing about being introvert. There is nothing wrong about it! It's acutally quite awesome. We are doing the thinking while extroverts are doing the talking. We are the brains, the master minds behind it all! We should embrace it! Not try to hide it away and pretend to be extrovert like the rest. It is always awkward as hell anyway. 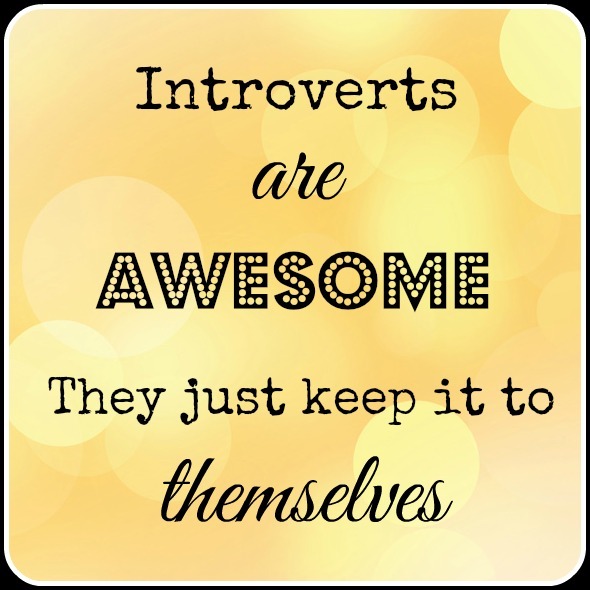 Only around 10% of the population in Denmark is introvert and that's why we never get a fair chance anywhere, but i really hope that people will open their eyes and see the potential in the two kinds of people like they did when they accepted that some people were actually lefthanded and there was nothing wrong with it!